Book Adrian Chiles as a keynote speaker. Adrian Chiles is one of the UK’s most versatile broadcasters. Between 2010 and 2015 Adrian fronted ITV’s football coverage, including the Champions League, Euros, two World Cups and England internationals. During this time he also presented three series of his successful That Sunday Night Show, also for ITV1. For more information on keynote speaker Adrian Chiles, contact VBQ Speakers founding agent Leo von Bülow-Quirk on leo@vbqspeakers.com or 0044 7833 727090. 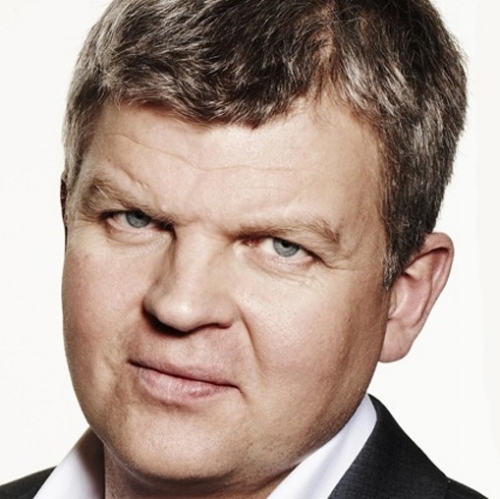 Adrian Chiles is one of the UK’s most versatile broadcasters. Between 2010 and 2015 Adrian fronted ITV’s football coverage, including the Champions League, Euros, two World Cups and England internationals. During this time he also presented three series of his successful That Sunday Night Show, also for ITV1. Adrian co-presented Daybreak with his long-time on-screen partner Christine Bleakley in 2010 and 2011. He launched The One Show (BBC One), Match of the Day 2 (BBC Two), The Apprentice: You’re Fired (BBC Two) and Working Lunch (BBC Two), and also presented several one-off documentaries and documentary series for the BBC including: Panorama (BBC One), Asian Millionaires (BBC Two), Working in the Dark (BBC One), So What Do You Do All Day? (BBC Two), It Beats Working (BBC One), Royal Millions (BBC One), and What Ron Said (BBC One). In 2016 Adrian hosted a two-part documentary series for BBC Two entitled My Mediterranean with Adrian Chiles, exploring the various religious festivals and customs in the region. In 2016 Adrian presented a Panorama special investigating the reasons Britain voted to leave the European Union for BBC One and a documentary for BBC Two entitled Whites vs Blacks: How Football Changes a Nation. Other notable appearances include Room 101 (BBC One), Would I Lie To You? (BBC Two), Have I Got News For You (BBC One), and Insert Name Here (BBC Two). As a radio presenter Adrian currently hosts 5 Live Daily on Monday and Tuesdays. He has previously presented the Friday edition of 5 Live’s drive time show, Financial World Tonight (BBC Radio 4), Wake up to Money (BBC Radio 5 Live), and 6-0-6 (BBC Radio 5 Live). His radio show, Chiles on Saturday (BBC Radio 5 Live) won a Sony Radio Academy Gold Award in 2002.